Quincy’s Quilting is a proudly Canadian and locally owned quilt shop with a variety fabrics, patterns, notions, and kits. There are thousands of fabrics and quilting related products online available for purchase. We have a large variety of Canadian Quilting content and are always looking for new fabrics, patterns, kits and notions created by Canadian designers to supplement our vast inventory. Quincy’s philosophy within the quilting community is that of inclusiveness. We aim to complement the local quilt shops we all love so dearly! After all, no one quilt store can carry every quilting item that is available on the market! Quincy’s Quilting began as a home based online quilt shop out of Edmonton, Alberta and opened for business on January 2nd, 2015 and is owned and operated by Jocelyn Smith. 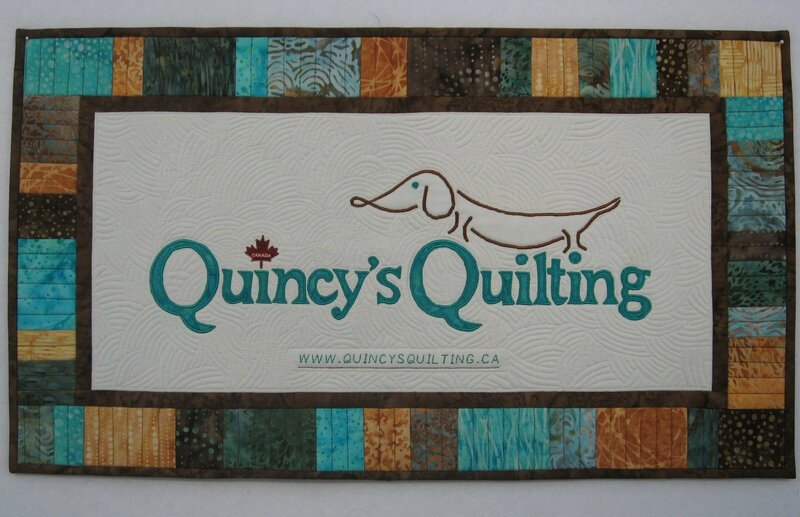 Quincy’s Quilting is named after one of Jocelyn’s miniature dachshunds. Quincy can be quite vocal at times when giving her opinion on what merchandise to offer for sale – especially if her lunch or dinner is late being served. After starting as an online shop, Quincy's expanded and opened a store front in Leduc, Alberta on August 31, 2016. A short 5 weeks later, we experienced a flood at our pretty little quilt shop on Thanksgiving Monday October 10th which required us to temporarily close for renovations. We were subsequently closed for 3 months and reopened again for business on January 7, 2017. Jocelyn’s love of quilting comes to her from her mother, who has been an avid crafter all her life. Deciding to leave her corporate life as a banking professional in the past, Jocelyn brings a keen business sense to Quincy’s Quilting. She attended her first quilting class in 1990, which resulted in her first UFO! Since that time she has continued with her love of exploring the use of colour through cross stitching, sewing, scrapbooking, and of course quilting!! Jocelyn is a huge fan of the current adult colouring book trend and also enjoys both traditional and “modern” quilt designs. Her guilty pleasure is fabrics designed and created by Tula Pink and Kaffe Fassett. Visit Quincy’s Quilting online today at www.quincysquilting.ca, call us toll free at 1-855-886-8505 or visit us in person at our newly relocated and expanded shop at 4801 50th Ave in Leduc, Alberta T9E 6X8.